Once regarded as the largest furniture store in the world – Maple & Co. Maple & Co were a manufacturer and retailer of top quality furniture and upholstery. They were active in London’s Tottenham Court Road from the 1840’s up until their closure in 1997 after several changes of ownership. Product from Maple & Co stores was sold worldwide and has graced the home, and embassy, of many a British ambassador as well as those of diplomats and other noteworthy individuals. The owner of the business was Sir John Blundell Maple who was born in 1845. The business which became Maple & Co was actually originally started by his father, John Maple, in a small town called Horley which is in Surrey. Following some growth, the business relocated to premises in Tottenham Court Road. John Blundell Maple joined his father’s business when he reached the age of 16, after having had a good education which was made possible by his father’s initial success with the fledgling business. It soon became apparent that his business skills were much superior to those of his father and, as a result, things developed well and John Blundell Maple was detined to be running the company within a few years. He recognised the opportunity that had presented itself and he started to develop the business into what would become the largest furniture store in the world, selling high class furniture to those who had the money to be able to afford it. This was a period of fast expansion and growth fo the British Empire and John Bludell Maple seized the opportunity to grow and expand with it. The firm achieved high volumes of worldwide sales to wealthy individuals who could afford his products. Maple & Co were notable for supplying furniture to such prestigous addresses as Tsar Nicholas’ Winter Palace as well as British Embassies around the globe. Maple & Co furniture was also supplied to the Hofburg Palace in Vienna. Their furniture was manufactured in a factory which was known to be the largest anywhere in the world. It was reputed to occupy an area where, at one time, two hundred houses had stood. The workforce was very large as it needed to be if the firm was to stand a chance of keeping up with demand for their products. An advantage was gained by Maple & Co’s policy of making use of the latest technology whenever they could. These technologies included steam power and electrical power plus the firm had a large fleet of delivery vehicles to take the products to anywhere in the UK. Maple & Co had several other UK locations in addition to Tottenham Court Road, including Birmingham, Leeds and Nottingham. As a result of the company’s success, John Blundell Maple became very wealthy. His interests reached beyond those of the business and he purchased a large country estate called as Childwickbury which is near near St Albans in Hertfordshire. He was an avid racehorse owner and racehorse breeder who ended up owning stables in the heart of the horse racing community, Newmarket. He mixed extensively and freely with the elite of the racing world at that time and his horses won numerous races. Another avid interest of John Blundell Maple was that of politics and in 1887 he was elected as the Conservative MP for Dulwich after which he was knighted five years later. John Blundell Maple was made a baronet in 1897. Maple was a generous public benefactor. Amongst his good works were the funding of the Sisters Hospital in St Albans which was named after his two daughters who had sadly both died whilst quite young and in successive years. Maple also funded Clarence Park and the rebuilding of the University College Hospital located in London. In later years, in the 1930’s and long after John Maple’s death, the firm amalgamated with H H Martyn, of Cheltenham, furnishers and decorators and it was eventually acquired by Waring & Gillows much later, in 1980. Thier earlier massive success did not continue however and the firm declined until it was eventually put into receivership in 1997. John Blundell Maple died from Bright’s Disease in 1903, aged 58. This was just months after he achieved his ambition to be admitted to the Jockey club. 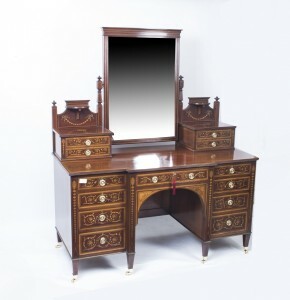 Furniture made by Maple & Co is much sought after but it is not particularly rare. However, due to its very high quality it does tend to fetch very good prices.